… even if it’s nonsense for the most part. Today marks the first day of “spring,” as I am the very first to inform you of because of course you start your day right here. 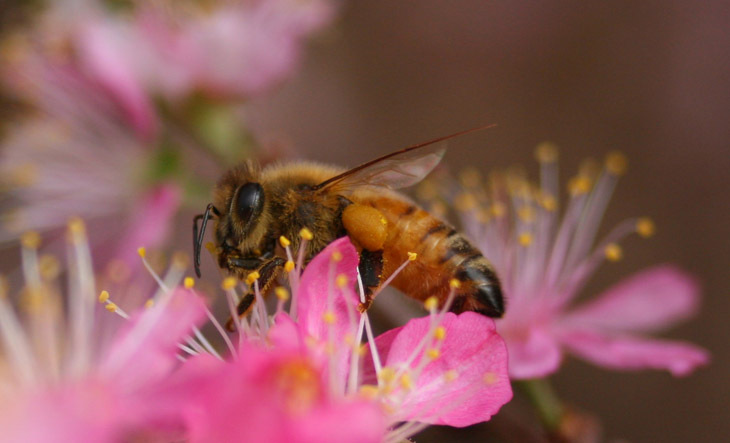 Most people associate spring with flowers and pollinators and trees in bud and birds nests and all that, of which we are slowly seeing the signs of here, just not today, which is rainy and overcast. So all of the images from this post were taken in “winter,” though only a few days ago. 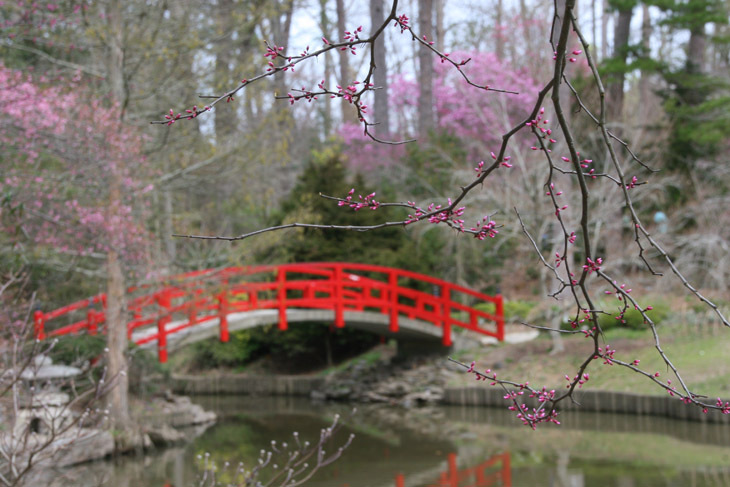 On a trip to a botanical garden, I danced around in various positions to place the redbud branches, among the first buds to appear in this area, framed around the red bridge – no ducks or geese were inclined to cooperate in the composition. 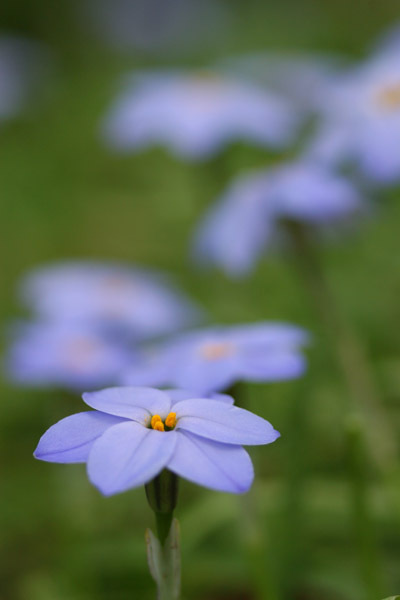 Cultivated flowers were able to be found elsewhere, but they don’t count. Does this count? I have to admit I’m not sure, since they were growing in a patch of lawn in the same garden, and I can’t vouch for whether they simply appeared there on their own or were planted – I’m leaning towards “natural,” for whatever definition of that vague term you like. I have not identified these yet; you know, most of our more specific names for colors actually come from flowers, so trying to narrow the search choices down from “blue” or “purple” is hard to do without skewing the results towards something that you know isn’t right. I’m going to consider these cultivated, given their location, which was in a planted area in the NC Botanical Gardens about a week later, back on Thursday. 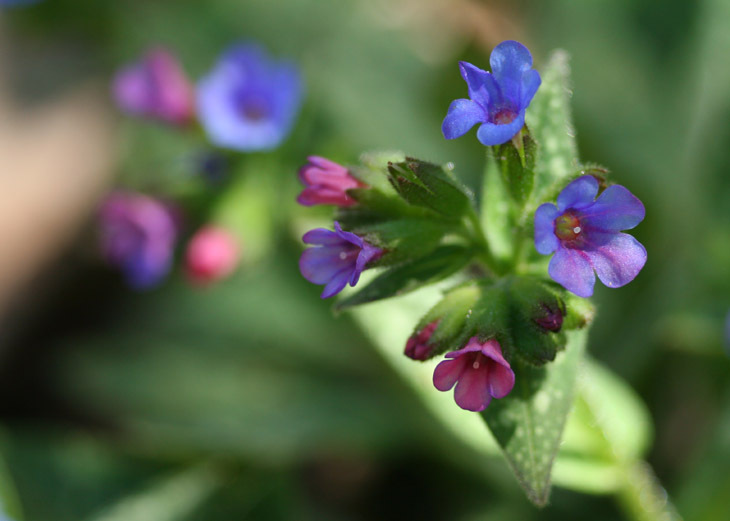 While the garden mentioned above was a decorative and display area, NC Botanical Gardens are an educational facility that typically features native plants, so these blue lungwort blossoms (Pulmonaria officinalis) might actually be found growing wild at this time of year, not too far away. However, I just liked them for the delicate mix of colors, a tiny patch of variety among the sparse plants making their first appearances – it’s still early. You can see how the dappled sunlight provided a mix of lighting, but direct sunlight might have washed out some of these colors. ‘Low contrast light for high contrast subjects’ is a good starting guideline. Were either of those species responsible for the foreshortened state of my next subject? It’s impossible to say, though in this area, birds are far more often the culprit. 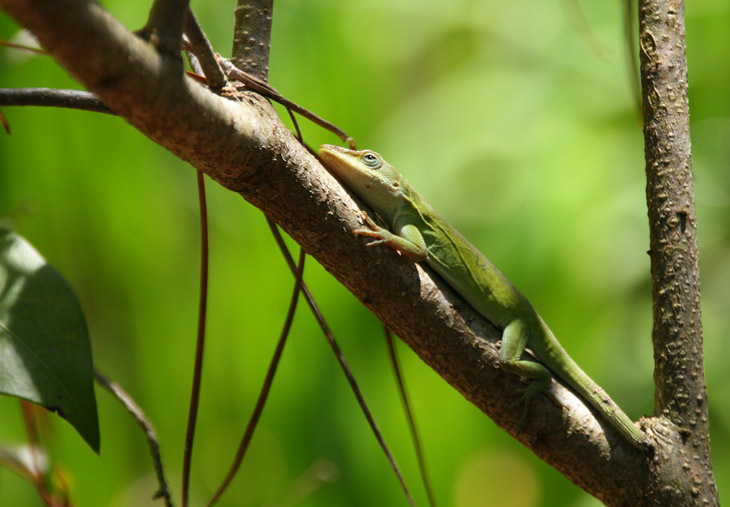 Since the garden is a prime habitat where they are frequently seen, I had been watching carefully for any sign of my friends the green anoles (Anolis carolinensis,) wondering if it was still too early for them to be out – obviously not, though it might have been the first day this year. This one scampered around with only moderate shyness, though often remaining in the shade, and it took some careful observation and timing to capture it when it turned enough to produce a reflection of the sun from its eye, known to photographers as a catchlight – that little spot of white on the eye is enough to make any species seem much more vibrant and ‘alive,’ and it’s a goal most nature photographers should at least keep in mind, especially among those species that have dark eyes with no visible iris. It’s not quite as necessary when the subject has detailed irises, like this next one. 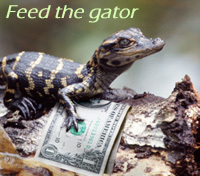 This is the same specimen seen in the previous post, only the following day. 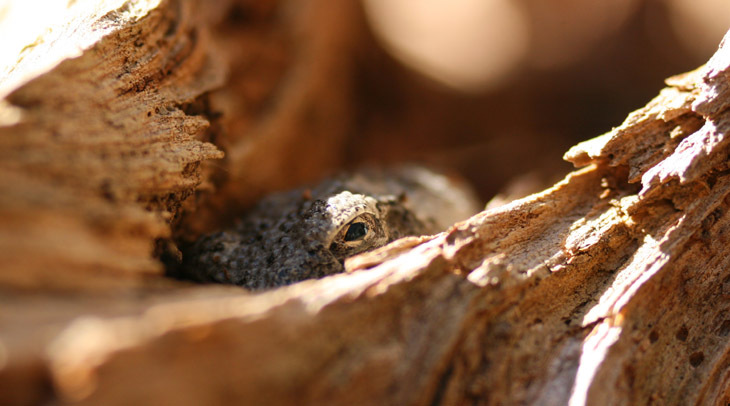 After being out for a while to warm itself up, it decided that it was getting too much sun (it really did get pretty warm those days,) and nestled down within a crevice to shade itself as much as possible. I liked the baleful look that this angle provided, though I admit it was hard to get an ominous feeling from something as long as the top joint of my thumb. And I close with another image of cultivated decorative flowers – I just liked the contrasting colors of the daffodil and the grape hyacinth. 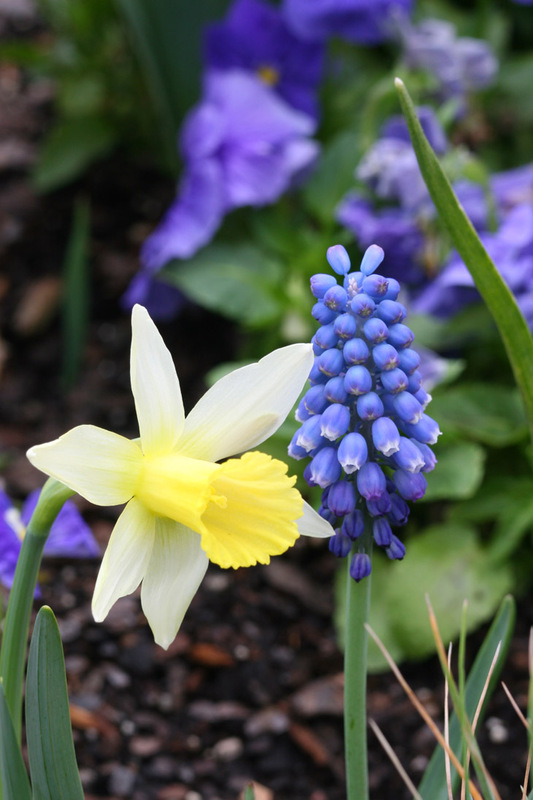 Actually, the daffodil was a lone specimen among the thematically blue flowerbed, and I suspect it was a stray bulb that got mixed in – if so, it’s a shame because the colors work well together. 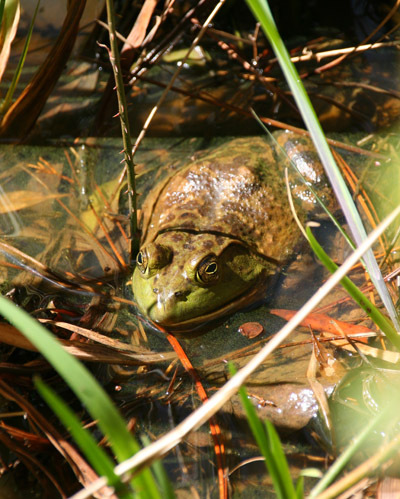 But either way, enjoy the vernal equinox!